Polly Apfelbaum (b. 1955) is best known for her large-scale installations and “fallen paintings,” compositions of dyed synthetic fabrics that she places directly on the floor. The exhibition Chromatic Scale: Prints from Polly Apfelbaum, currently on view in the Teresa Lozano Long Gallery, presents a focused survey of Apfelbaum’s recent prints. In more recent years, Polly Apfelbaum revisited printmaking, a process she explored as an art student at the Tyler School of Art in Pennsylvania. Creating most of her prints at Durham Press, Apfelbaum often collaborates with master printmaker Jean-Paul (J.P.) Russell to create her colorful, abstract works. Her works reference abstract, minimalist, and Pop art. She was influenced by artists including Helen Frankenthaler, Morris Louis, and Jackson Pollock, but Apfelbaum’s work differs in style by incorporating energy, playfulness, and wit, as well as her love of popular culture and affirmative view of femininity. Her “Dogwood” prints are the result of woodblocks made from from slices of dogwood tree branches sourced in Bucks County, Pennsylvania, where Durham Press is located. “The ‘Dogwood’ prints were made from the wood of a dogwood tree, the Pennsylvania state tree. I grew up in Pennsylvania, Durham Press is in Pennsylvania on Dogwood Lane, and a dogwood fell down on their property. So we put it to work,” says the artist. Apfelbaum’s arrangements are generally improvisational, though she cites a dress from the Finnish design firm Marimekko as inspiration for the dogwood prints like “Little Dogwood 66” (2012). 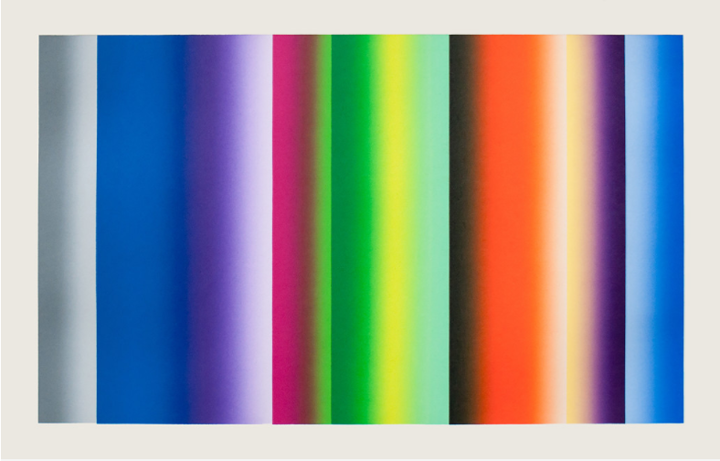 “Byzantine Rocker 6” (2014) is a prime example of Apfelbaum’s fondness for blending colors through a “split-fountain” or “rainbow roll” technique, in which multiple colors are partially mixed on a block to achieve a gradient effect when printed. “In the print world the technique is considered really cheesy, and that makes me like it even more. As far as the process goes, we lay out two-color and three-color combinations, which get rolled onto the shapes. I then place the blocks face-up until I’m satisfied with the composition.” The title of this work implies a back-and-forth movement, mimicking the way the eye moves across the bands of color. 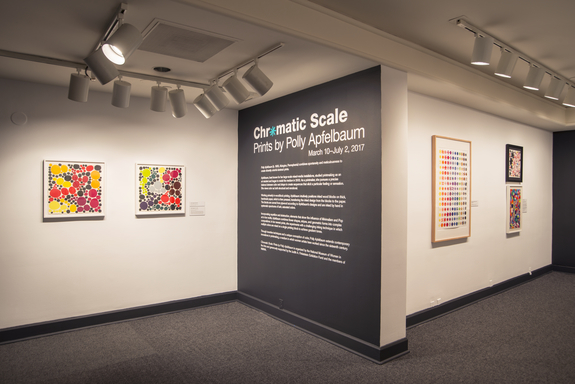 Visit the museum to see Chromatic Scale: Prints from Polly Apfelbaum before the exhibition closes on July 2, 2017. —Madeline Barnes was the spring 2017 digital engagement intern at the National Museum of Women in the Arts. 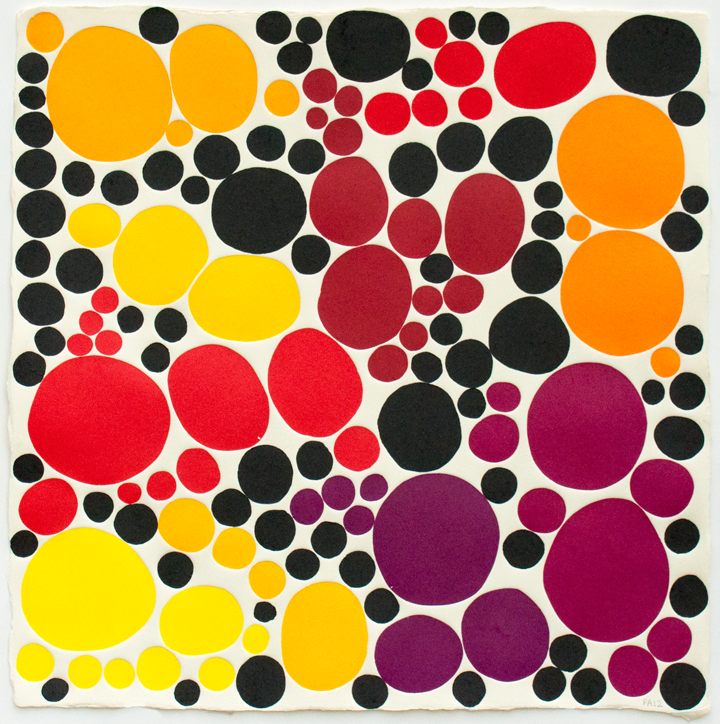 This entry was posted in News and Updates, NMWA Exhibitions and tagged Chromatic Scale: Prints from Polly Apfelbaum, Polly Apfelbaum by Women in the Arts. Bookmark the permalink.